I’m at the age now when I like it when people call me young. I’ve done a few different jobs, lived in a few countries, and despite never being exactly overly friendly I have known a lot of people. But I never see most of them anymore, in fact I have no idea where they’ve all gone. Last week I was cycling over a bridge absent-mindedly staring at a woman as she navigated a pavement/footpath while blowing into the blower, I was struck by her accent it jarred and reminded me of someone I used to know, not someone I knew well you understand, just someone I knew. Briefly I glanced back in time into that memory and I was again back there as if I knew her still. I cycled on. I’ll never see either of those two women again nevertheless I wondered where my friend has gone, what she is doing. I have known thousands of people but I never see them, bump into them or even hear about them. Where are they? I went to a school reunion last Saturday, 25 former classmates showed up out of a hundred. Where are the rest of them gone? Sure they are somewhere but in a country as small as Ireland you would really think that you might bump into them more often. Where are all the people I once knew? Has everyone in Ireland just moved to one of those pretty estates on the outskirts of civilisation? When Ai Weiwei exhibited his Sunflower Seeds in the Tate Modern London there were over 100 million individually hand crafted porcelain seeds. 100 million is a number we hear bandied about all the time. Whether it be money, people or debt it is not a number we are afraid of using. Me neither, that is until I saw the Sunflower Seeds and realised I had no real notion of 100 million. This irked me, surprised me and in the end helped me. I now understand that I don’t understand. When I expect to meet the six, seven hundred people I have known, when I am surprised that I don’t bump into them every day maybe it is because I do not even understand the small number of people that live in Ireland, or perhaps I have only known two hundred or so, but in my mind that is thousands. Maybe the problem is that I don’t understand any of these numbers. Does that explain why I never meet anyone anymore? I suppose we mostly congregate in our little social hubs, I don’t have kids so not going to be bumping into people on the school run. I don’t work in and around town anymore and even when I did it’s not as if I was walking from conversation to conversation. Where is everyone gone? Abroad? Well funny I should mention that, in Paris I frequented one bar above all others, and even when I go back now I can still go there and reasonably expect to meet people I know, indeed I would be shocked if I didn’t. But local bars are not as popular anymore for many of us. I don’t have one in Dublin. I think many people just stop going anywhere, why would they? Some never really liked going out in the first place. They are more than happy to bunker down for the foreseeable and use the TV as an arm’s length portal to the big bad world out there. I still see people I have actually lost now and again. My sister warned me I would, told me that she still sees a friend of hers long passed, once or twice a year. Snatched glimpses, not quite grasped pirouettes. I get what she means. I hear and see the people who are missing from my life on the street, I hear their voices and I sometimes just forget they are dead. Amounts to the same thing. Strange then I don’t see the rest of them any more, the people that are still around, they seem to have all gone. 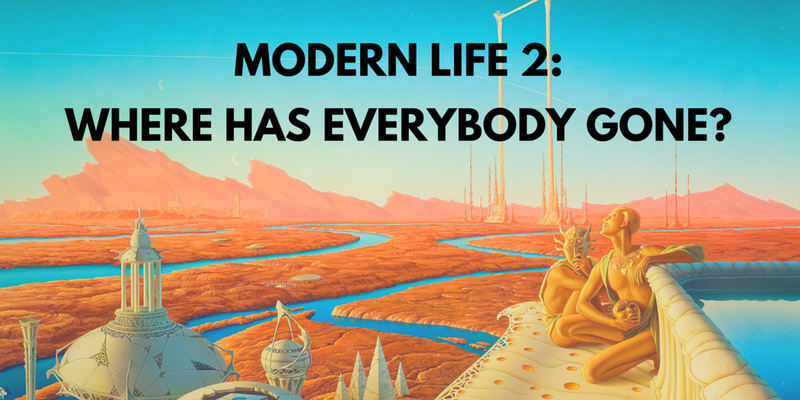 Read Modern Life 1: What the Hell do we Want? “Seeing” the dead, that moment of false recognition, is a common phenomenon soon after a loss. It’s the result of an unconscious yearning to see the lost one. Usually it goes away after six months or so. After that, it’s likely a sign of unresolved grief. less flippantly, I think this feeling is probably universal to anyone who has traveled, or changed social circles, over time, perhaps we become more in tune to the concept with more time on our hands?